Vol. 8, no. 31 (July 8, 1893)-v. 9, no. 13 (Mar. 10, 1894). The Capital City Courier, published in Lincoln, Nebraska, was established in 1885. The first extant copy is from v.3, no.1 (Dec. 17, 1887) at which time it was published by Wessel & Dobbins. Later the paper was published by the Courier Publication Company under the names Sunday Morning Courier (June 18, 1893-July 2, 1893), the Saturday Morning Courier (July 8, 1893-March 10, 1894), and the Courier (March 17, 1894-April 4, 1903). A front-page piece in the first extant copy describes the Capital City Courier as "a newspaper that is honestly endeavoring to do its duty toward the community; that it is earnestly trying to prevent the looting of the city treasury by dishonest contractors and subservient officials." 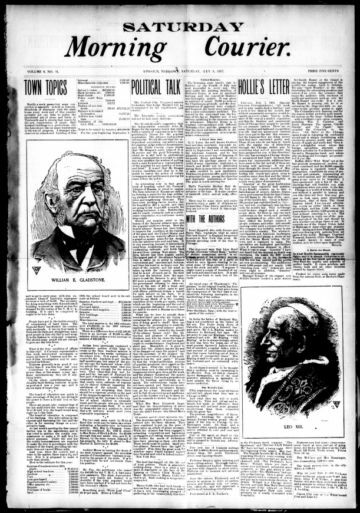 Later, in a March 31, 1894 issue, the political position of the paper was more explicitly stated: "Anyone who intends to cast a vote for an Independent or Democratic candidate should remember that the Independents and Democrats have already had altogether too much encouragement in this Republican city and county, that the apathy of Republicans has allowed the opposing parties to capture the more important offices, and that there is much danger in allowing them or either of them to obtain a stronger foothold." In 1894, W. Morton Smith became editor of the Courier. In 1895, Sarah B. Harris and noted Nebraska author, Willa Cather, were listed in the paper as W. Morton Smith's associate editors. Harris assumed full editorship and managerial duties on September 19, 1896, and Smith was then listed as associate editor. In 1898 Cather left to pursue other work; however, she continued to send occasional pieces to the paper for publication. By then, the Courier's focus had become increasingly social: calling itself the "official organ of the Nebraska State Federation of Women's Clubs." News was still a substantial focus of the Courier, of course, under Harris. A scathing report on poor water quality and improper drainage systems in Lincoln appeared in 1897, conditions which were blamed on a corrupt city council. International news appeared frequently, and in 1901, Queen Victoria's death was front-page news. The invention of photography allowed a mingling of class and geography; the photographs of ordinary Lincoln residents, as well as famous people such as Teddy Roosevelt and Pope Leo XIII, shared space. From 1894 to 1897 the Courier varied between 12 and 22 pages; by 1900 it ran consistently between 8 and 12 pages. Over time it shifted from a two-column to a four-column format, and its annual subscription rate decreased from $2 to $1. The paper's consistent masthead consisted of elaborate capitals, with the "O" featuring a cherub. Both the "C" and the "O" had sunlight-like rays emanating behind them. The last issue of the Courier ran on April 4, 1903.